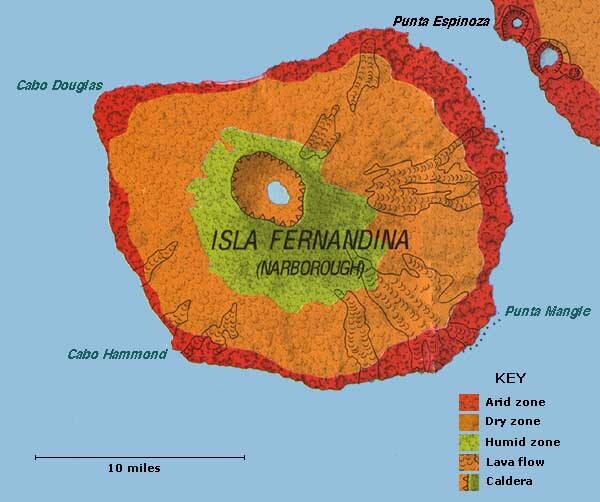 Fernandina Island is the third biggest island of the Galapagos and the westernmost. It is almost circular, about 21 miles across at its widest. The highest point is 4,900 feet. Its land area is 248 square miles. It is comprised a single huge volcano, which is still active. In 1968 the central crater collapsed by 1,000 feet in a matter of days, causing earthquakes on the island. The island was named in 1832 after King Ferdinand II (Spanish: Fernando) of Spain. The English named it Narborough after Admiral Sir John Narborough.